Claude McKay: “Flame Heart” from Selected Poems of Claude McKay, Harcourt, Brace,. Jovanovich. ... George Orwell: “Some Thoughts on the Common Toad” from Collected Essays, Journals and. Letters of George Orwell, ... Answers to Your Questions about the AP Literature and Composition Exam . . . . . . . . . . . . . . . . . . 6. 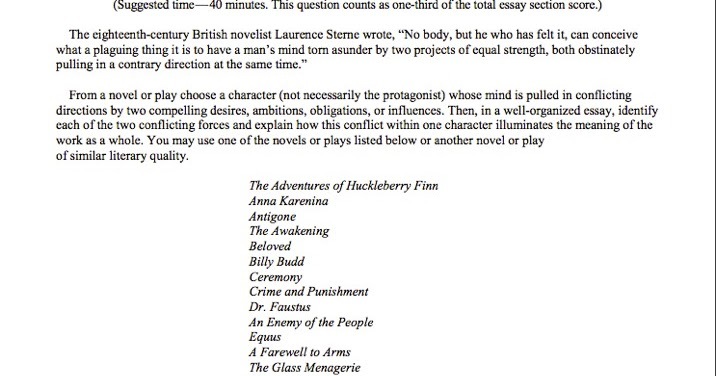 The prompt, which generated the essays being scored, was from the 2007 AP English Literature exam, as follows: ... Then write an essay in which you compare and contrast the two poems, analyzing how each poet uses literary devices to make his point. I've done my .... Do not use little hearts, stars or circles to dot your “i's.